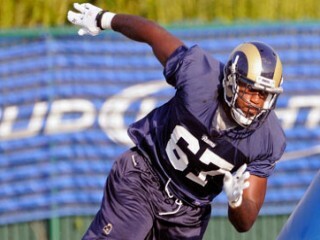 George Selvie is an American football defensive end for the St. Louis Rams. He played college football at the University of South Florida. He was drafted by the Rams in the 7th round of the 2010 NFL Draft. 2009: One of the most decorated players in BIG EAST history and the only two-time All-American in USF history ... Named to the All-BIG EAST First Team by Phil Steele ... A semi-finalist for every major national defensive award ... The NCAA active career leader in tackles for loss and among the top five in sacks ... Piled up 69.5 tackles for loss in his career and was 5.5 shy of tying the NCAA career record ... Also has 29 career sacks ... Seventh on the team with 42 tackles during the 2009 campaign ... Second on the team with 9.5 tackles for loss and third with 3.5 sacks ... Also forced a fumble and recovered a fumble ... Starter, played and served as a captain in every game ... Five of his 9.5 tackles for loss came against ranked opponents ... Marquee performance with two tackles for loss, one sack and three quarterback hurries in defeated of No. 19 Florida State ... Owns the USF record for most forced fumbles with nine ... Made 50 career starts, more than any other USF player, and stand second with 51 games played ... Earned the team's Lee Roy Selmon Award and the Defensive Front Seven Award. 2008: Led all NCAA players in career tackles for loss throughout his junior season ... USF career leader in tackles for loss and sacks ... Became the first two-time, first team All-American in USF history when he was selected by the American Football Coaches Association ... Also a second-team All-American according to the Walter Camp Foundation ... A consensus first team All-BIG EAST selection ... Tallied 43 tackles, 13.5 tackles for loss and 5.5 sacks ... Set opponents back 72 yards on TFL and 38 yards on sacks ... TFL numbers came while facing a double team on 79 percent of running plays ... Sack total was achieved while squaring off against double team 53 percent of the time ... Played in 12 games and started 11, but really missed the majority of three games with an ankle injury ... Also forced one fumble and logged two fumble recoveries ... A late-season candidate for the Nagurski Award, Hendricks Award, Lombardi and Lott trophies ... Registered at least a tackle for loss in nine games ... Single-game best four tackles for loss and two sacks against Louisville ... Also had multiple TFL against FIU and West Virginia. 2007: Consensus First Team All-American (AFCA, AP, ESPN.com, FWAA, Walter Camp, Rivals, CBSSportsline.com) ... 2007 BIG EAST Defensive Player of the Year ... Followed in footsteps of Warren Sapp, Terrell Suggs and Julius Peppers by winning the Bill Willis Award, which is given annually to the top defensive lineman by the Touchdown Club of Columbus ... Named Tampa Amateur Male Athlete of the Year by the Sports Club of Tampa Bay ... Also a finalist for the Ted Hendricks Award and the Bronko Nagurski Trophy ... Posted the greatest defensive season in USF history ... Led the country with 31.5 tackles for loss and needed just one more to break the NCAA record ... TFL total established new USF and BIG EAST single-season records ... Also ranked second in sacks with 14.5 after leading the country in the category for the majority of the season ... Tied for the USF career record with 20 sacks through 26 career games ... Collected three or more TFL in six games ... 59 total tackles, 46 solo, three forced fumbles, 13 quarterback hurries and one blocked kick ... Established USF single game records with six tackles for loss and four sacks in the season opener against Elon ... Did not slow down the next week with 3.5 TFL and 1.5 sacks against Auburn ... Named Walter Camp National Defensive Player of the Week after recording five TFL and three sacks in a win against North Carolina ... Collected eight tackles, two for loss, and one sack in win over West Virginia ... Also had four TFL outings against UCF and Cincinnati, while collecting three against Syracuse. 2006: Started all 13 games at right end and led all linemen (third overall on team) with 84 tackles, 15 for loss and 5.5 sacks ... Eight tackles, including 3.5 for loss, a nine-yard TD recovery and a forced fumble in the WVU win ... Season-high 10 tackles at Cincinnati ... Two sacks vs. Florida International ... Nine tackles in wins over FIU and North Carolina ... USF's Defensive Rookie of the Year ... Named a freshman All-American by The Sporting News as well as to the publication's BIG EAST all-freshman team ... He was the National Defensive and the BIG EAST Player of the Week after USF's win at West Virginia. 2005: Utilized redshirt season ... Won USF's Overachiever Award for his outstanding work in the strength and conditioning program. PINE FOREST HIGH SCHOOL: Class 3A second team all-state ... 55 tackles with six sacks ... Super Senior in Pensacola News Journal ... Emerald Coast all-star ... Coached by Jerry Pollaro ... Also participated in weightlifting. Born March 6, 1987 ... Son of George and Twana Selvie ... Moved several times while following father's military career during childhood ... A Buick rolled off a car jack and onto his head as a infant ... Still has a dent in his head from the accident to this day ... Recruited to play center but was shifted to defensive end during first season in green and gold. View the full website biography of George Selvie.